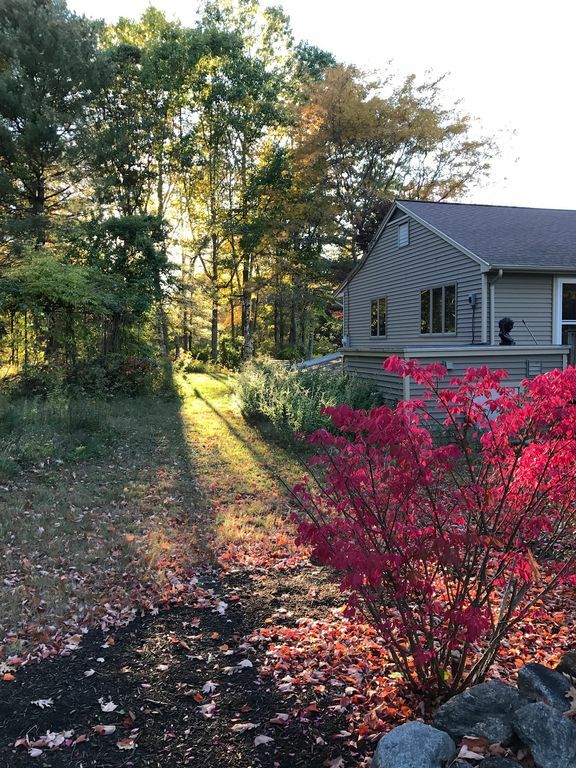 Spacious home with many updates on a quiet road 5 minute drive from public access to lake or rive and town of Shapleigh. It has a double bed and a single bed but can accommodate up to 6 people if you opt to utilize 2 pull out/fold down couches. Relax in the sauna and sun room downstairs and grill in the backyard. Smart TV and wireless internet available. There is nearby public access to swimming in Mousam River, also swimming and boating on Mousam lake. Beautiful setting for bike riding and the White mountains are 1-2 hour drive away for outstanding hiking! Some tasty eateries and shops within 5 - 10 minute drive for eating out breakfast, lunch, and dinner! Macdougal Orchard nearby for summer and fall fruit picking. Please see our insider's guide for specific recommendations. Was looking for a romantic getaway for my birthday. Couldn't decide on something secluded or near beaches. This place offered the best of both. Very secluded with beautifully natural landscaped yard with a short drive to the beaches. I would definitely recommend! So glad you had a nice time! Thanks for the comments! The rural setting was beautifully private, and the landscaping was so very peaceful. The owner was easy to communicate with and checked in with us. Unfortunately, it appeared that the owners are fairly new to renting, because some features were not renter-friendly; however, they can be easily fixed and did not have a negative effect on our overall stay. The following were the most prominent: The refrigerator was filled with the owners' personal items, and there wasn't a section designated for guest use. Also, it was great that the house was dog-friendly, but the area rugs were covered with dog hair. There was no binder, or even a simple print-out with basic directions. What to do with trash? Recycling? Directions and brochures/menus to local businesses? Checking out procedures? If these situations were attended to, we would love to return; however, if this is the owners' expected norm, then we will not be returning. We apologize that your stay was disappointing. Unfortunately we checked our records and this renter requested to skip the cleaning fee to come in early so it seems the review is unfounded. We have addressed concerns about check out and local recommendations. 2) There are 3 large televisions each with three remotes with no instructions how to use. Could only get 4 channels to choose from. Thanks for your feedback. We apologize and have addressed these concerns for future renters.